Many residents have been forced from their homes as a spillway is opened to protect major cities from the flood. Photo by Gallo / Getty / Al Jazeera. That way of life is now in danger. First there was Hurricane Katrina and Hurricane Rita, two storms in 2005 that famously devastated the Gulf Coast, and literally changed the map of southern Louisiana, quickening already-rapid coastal erosion while destroying homes and communities. Just as coastal residents had begun to recover from those storms, last year's BP Deepwater Horizon drilling disaster had a catastrophic effect on the economy and health of the region and its people. Now, the waters of the Mississippi River have reached historic heights, and Encalade is worried. “For the small fishers, it’s a very thin line between losing money and making a profit,” he explains. The Mississippi is central to economic life here on the Gulf, and it’s rising waters have wide-ranging effects, from disrupting shipping and causing rising prices for gas, food, and other necessities, to a loss of tourism dollars and the destruction of an estimated 100,000 acres of crops, as well as oyster fisheries, in the now-flooded Atchafalaya Basin. A third generation oyster fisherman, Encalade serves as president of the Louisiana Oystermen Association, which represents minority fishers, including African-American, Vietnamese and Cambodian and Native Americans. “This flooding is going to have a enormous economic effect in the fisheries,” he explains. 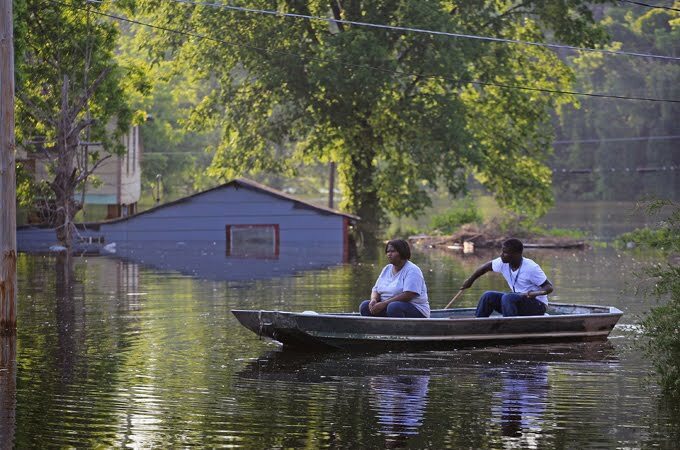 The U.S. Army Corps of Engineers, the federal agency charged with maintaining the levees and overseeing the flood controls, has acted to preserve the safety of Baton Rouge and New Orleans; two cities perched along the Mississippi. To reduce the stress on the levees around the urban areas, the Corps has let water flow through the Morganza Spillway, flooding farmland and rural communities upriver from Baton Rouge, including thousands of houses, farms and oyster fisheries. The Morganza, a flood control structure designed and built in the aftermath of a devastating 1927 flood of the Mississippi, has only been opened once before, in 1973. The high waters in the Mississippi have brought into focus problems that have existed for a generation. Land loss caused by oil company drilling has already displaced many who lived by the coast, and the pollution from treatment plants has poisoned communities across the state -- especially in “cancer alley,” the corridor of industrial facilities along the Mississippi River south of Baton Rouge. Matt Rota, science and water policy director for the Gulf Restoration Network, says that pollution carried by the Mississippi will create a massive “dead zone,” a lifeless stretch of water that he says will further harm the Gulf ecosystem and impact fishers. According to Rota, the combination of oil company exploration with the construction of levees that have cut off the natural delta-building processes of the river has resulted in a massive loss of coastal land. The state loses a football field-sized area of its coast every 45 minutes, he says. Since 1930, Louisiana has lost over a million acres of land, an area the size of a small state. Even with the Morganza open, high water levels continue to alarm residents of New Orleans, who are suspicious of the Army Corps of Engineers. “We can’t trust the levees, and we cant trust the Corps,” says Monique Harden, the co-director Advocates for Environmental Human Rights. While freeing the river in these areas would carry great costs, it would also help restore the coast, and ease pressure on other levees, such as those protecting New Orleans, explains Rota.